Did Martians build the Pyramids? I doubt that they did. 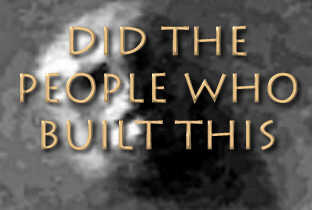 However, some people believe they may have, along with a whole host of other theories as to who built them and why. This site is a quick reference to these various Pyramid theories and where to find them on the web plus any hot news. Please e-mail me with updates or sites that you come across at [email protected] This page has been visited times since 31st Dec 1996. Hot news. By special permission of Quest magazine here is the latest on the clandestine tunneling thought to be taking place within the Pyramids! Introduction. Why do I maintain this page? Did some long forgotten civalisation build them in 10,500BC? Or was it just the Egyptians in 2,500BC? Were they a power station? Were they built as a warning of an impending global disaster? Or were they just tombs for the pharoahs? My imagination was sparked by reading Graham Hancocks best selling book 'Fingerprints of the Gods'. Though I can spot some flaws in the arguments that Hancock and others put forward, I found myself at least accepting that there is much to doubt in what the Egyptologists put forward in their 'conventional' theories. Certainly in the mathmatical evidence put forward it is clear that whoever built the pyramids had far greater knowledge about the Earth and the heavens and mathmatics than the ancient Egyptians (and other ancient civilisations such as the Myans) have been credited for. The conventional version of history clearly needs to be rewritten. What disappoints me the most is that there would seem to be so much more research that could be done that may help to prove these theories correct or not. Yet it appears the conventional Egyptologists are the ones who seem most unwilling to do this as their reputations may be at stake. Not only would this research prove or disprove these theories, but if any of them are even half correct there is clearly still much we could learn about our past. And if Hancock is correct, about our future too! It is awfully difficult not to come to the conclusion that there is some sort of cover up going on, why else the reluctance on the part of the authorities to allow any further research to be made once some potential evidence has been uncovered. See my follow on page Great Pyramid Cover-up for more detail. There are many theories as to what the pyramids are, who built them and when. Most of the sites referenced here put forward one of those views, usually in a biased manner (and to promote a book!). So I thought I would maintain this page as an unbiased collection of all the pyramid theories I could find and help point you to them. I will also try to maintain a page of some of the fascinating facts and figures myself as I come across them. Please vote for my page. Some images copyright Lawrence Wilkes .